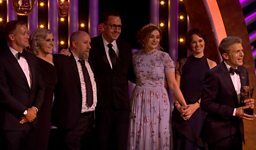 BBC One - Casualty - Casualty wins big at BAFTA! The BBC medical drama was up against stiff competition such as Emmerdale, Hollyoaks and Coronation Street. George Rainsford (Ethan) and Chelsea Halfpenny (Alicia) collected the award along with Oliver Kent (Head of Continuing Drama), Lucy Raffety (Series Producer), Simon Harper (Executive Producer), Mark Catley (Series Executive Consultant) and Erika Hossington (Former Series Producer). This is the second time Casualty has won a BAFTA, previously winning Best Continious Drama in 2007.